THURSDAY, Sept. 25, 2014 (HealthDay News) -- Although the type 2 diabetes epidemic is commonly linked to being overweight or obese, excess weight isn't the only factor driving the trend, new research suggests. In just the past few months, at least three new studies have reported on other factors that may underlie a type 2 diabetes diagnosis. These factors include genetic mutations, a lesser-known hormone called amylin, as well as disturbances in the body's natural clock. The idea that type 2 diabetes isn't only caused by obesity isn't a new one. 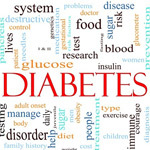 "Genetics is a big factor in type 2 diabetes. Certain ethnic groups get type 2 diabetes at much higher rates, and at much younger ages than other groups," said Dr. Christine Resta, an endocrinologist at Maimonides Medical Center in New York City. "Obesity is clearly part of type 2 diabetes for most people. But the diagnosis is probably about 50 percent luck, due to things like your family history, and 50 percent what you're doing, like your lifestyle. There are thin people who get type 2 diabetes, and some people -- no matter what they weigh -- just won't get diabetes," she explained. Type 2 diabetes is a disorder that causes sugar to build up in the blood. It develops as the body's cells become significantly resistant to insulin, making it difficult for those cells to use sugar for fuel. Insulin is a hormone produced in the pancreas that helps usher sugar into cells for energy. As a result, the pancreas produces more and more insulin. Eventually, the pancreas is no longer able to keep up with the demand for insulin. This is when type 2 occurs, according to the U.S. National Institute of Diabetes and Digestive and Kidney Diseases (NIDDK). Genes definitely play a role in type 2 diabetes, according to NIDDK. Family history and ethnicity also play a role. A sedentary lifestyle is also associated with the development of type 2 diabetes. While it's been known for some time that genes are at least partly responsible for type 2 diabetes, researchers don't know all of the genes or the genetic mutations that are involved. Even when specific genes have been identified, the best course of treatment isn't always clear. The latest genetic study focused on a gene called PPARG that was known to be involved in type 2 diabetes. But, the researchers found that 1 percent of people have one of nine mutations that affect how that gene functions. For these people, the risk of developing type 2 diabetes is increased more than sevenfold, according to a study in a recent issue of the Proceedings of the National Academy of Sciences. "We're moving in the right direction, discovering these mutations, but diabetes is a very complex disorder," said Dr. Joel Zonszein, director of the clinical diabetes center at Montefiore Medical Center in New York City. Zonszein said the decrease in the function of the PPARG gene would likely contribute to the "bad" obesity that occurs around the abdomen. "These are not necessarily people that look obese, and they don't necessarily have a high body mass index, but they have central obesity. We're seeing this more in people from Pakistan and India," he said. "What this study doesn't say is if having certain medication will correct the abnormality. Eventually, we'll be able to identify certain genes, and we'll be able to give better medications. We already know clinically that certain drugs work better in some patients than in others," he added. Another study, this one published in the Journal of the Federation of American Societies for Experimental Biology, looked at another hormone made in the pancreas called amylin. Normally, amylin works together with insulin to help the body process and use the sugars from food for fuel. But, researchers from the United Kingdom and New Zealand found that some amylin can get deposited around the pancreas. When this occurs, amylin can form into toxic clumps, according to the researchers. Those toxic clumps can then cause the death of insulin-producing cells, possibly leading to diabetes. The third study, which was recently published online in Diabetes Research and Clinical Practice, suggested that disruptions in the body's internal clock may be a factor in the development of type 2 diabetes. The researchers noted that today's 24/7 lifestyles constantly disrupt the body's natural sleep/wake cycles. Factors such as nocturnal lighting, shift work and unusual timing of food can throw the body's clock off. Whatever the additional causes might be, right now, weight is one of the few modifiable factors that can help manage type 2 diabetes. "If people lose just 5 to 10 percent of their body weight, they can make a difference in their diabetes. Exercise definitely plays a role, too," said Resta.